Cholera patients rest at a makeshift hospital in Hinche, Haiti, on Sunday. The announcement came as international health officials predicted that the scale of Haiti's cholera epidemic will exceed initial estimates of 200,000 over the coming months. "Having seen how the bacteria is behaving in this environment with these people, having seen just how poor and how hungry the people are, we know we have to revise our numbers up," Nyka Alexander, a spokeswoman for the World Health Organization, said in a phone call with CNN. 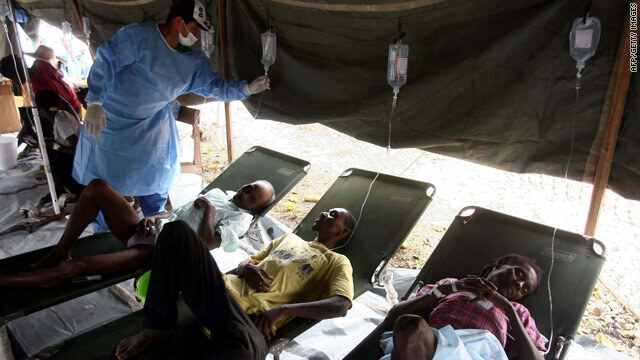 Health workers say the Haitian population lacks immunity to cholera and Haitian medical workers lack experience treating the infection because the bacterium has not been detected on the island in more than a century. The impoverished country's weak health and sanitation systems are only compounding the problem, which shows no signs of easing. "Another factor why this epidemic has spread as far as it has, and why it will continue to spread, is dirty water, poor sanitation, no toilets, malnutrition and poor access to health centers," Alexander said. "People have to walk five hours to a health center, and if you have diarrhea, you're not going to make it." She added, "The disease is showing the weaknesses in the country." International aid workers need money to deal with two major shortages: a lack of doctors and nurses trained to treat cholera, and "trucks to carry dead bodies," Alexander said. WHO says it has distributed enough rehydration salts for 60,000 people and enough intravenous fluids to treat 20,000 more severe cases of cholera. But last week, the United Nations announced it had received less than 10 percent of the emergency $164 million it requested to battle the epidemic. "That's clearly insufficient for an adequate response to the epidemic," U.N. spokesman Farhan Haq told reporters Monday in New York. He cited concern expressed by Nigel Fisher, the U.N.'s humanitarian coordinator in Haiti, who said that critical supplies and skills remain in short supply -- including doctors, nurses, water purification systems, chlorine tablets, soap, oral rehydration salts and tents for cholera treatment centers. Nationwide, 36 cholera treatment centers and 61 smaller treatment units have been set up, and more are being built, Haq said. He said that tests carried out in the north of the country, where the outbreak began and near where a Nepalese contingent of troops is based, have not determined who may have been responsible. He said the United Nations' anti-cholera efforts have resumed in Cap Haitien after having been suspended last week amid violence there. "The World Food Programme and WHO have been able to restart their operations in Cap Haitien, where the situation is now calm," Haq said. Much of the violence, which Haq said resulted in one confirmed death involving a peacekeeper, was aimed at U.N. peacekeepers blamed by some Haitians for bringing the disease to Haiti. But WHO's Alexander, in Port-au-Prince, said the situation for U.N. peacekeepers remained tense and it was not clear that the organization's anti-cholera efforts in Cap Haitien would continue. Medecins Sans Frontieres, a medical humanitarian organization also referred to as Doctors Without Borders, was continuing its operations. The teams that the Haitian government does have to collect the bodies of cholera victims sometimes face daunting challenges. On Saturday, Rochefort Saint-Louis said he and his team of Ministry of Health workers were attacked by angry rock-throwing residents when they arrived in a Port-au-Prince neighborhood to pick up victims. Saint-Louis told CNN the residents broke the windows of his government truck and then beat and robbed him of his cell phone and money. Meanwhile, amid the health crisis, candidates have been ramping up their campaigns in the final days before Haiti's November 28 national elections. The streets of the Haitian capital throbbed Monday with the sound of mobile amplifiers blaring music for some of the 19 candidates running for the post of president. In the western coastal town of Miragoane, political tensions exploded Monday. Antony Gae, a resident of Miragoane, told CNN that police fired guns to disperse demonstrators who were burning tires and accusing Haiti's main electoral commission of being biased. According to a recent report by the International Crisis Group, Haiti has held 13 elections since 1987, the "majority of which have been marred by delays, suspensions, widespread irregularities, fraud, boycotts, unrest and violence." Some presidential candidates have reportedly called for a delay of this year's elections because of the cholera epidemic.